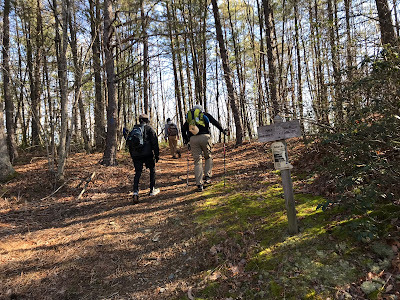 I headed out into the James River Face Wilderness this week with a group to explore some old trails and bushwhack in the wilderness - stuff I don't like to do when out solo for fear that no one would ever find me again. 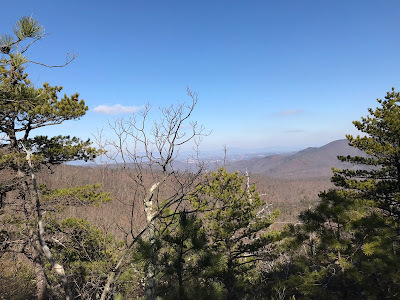 We started out hiking the Piney Ridge Trail, which is the original AT alignment back in the 1930's. 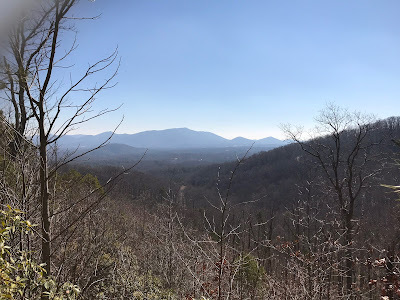 The Piney Ridge Trail today is one of the lesser used JRF access points, and I was surprised to find 5 vehicles already in the lot when I arrived. Clearly the Natural Bridge Appalachian Trail Club, which does some incredible trail work in this part of the state, was out exploring today. My colleagues arrived a few minutes after I did, and we all headed up the Piney Ridge Trail. The trail starts by continuing up an old woods road past a closed gate. A sign for the trail is shortly after this point. Older guidebooks indicate that the trail was originally an old road, but I did not see any indication of this. The Piney Ridge Trail offers an excellent workout, climbing nearly 1600 feet over its 3.5 mile length. Along the way are nice winter views and a small lookout, just off trail to the right, at the 2.6 mile mark. I had never seen this overlook before, having hiked right past it on previous hikes on this trail. Piney Ridge Trail looking west towards the Appalachian Trail. View from small overlook just off of the Piney Ridge Trail, at the 2.6 mile mark. 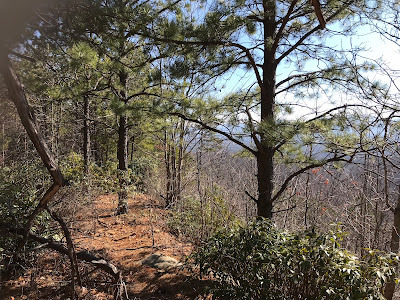 The Piney Ridge Trail ends at a place that the NBATC calls "Five Points" because it is a flat area where 5 trail sections converge. Both the A.T. and the Sulphur Springs Trail intersect, and the Piney Ridge Trail ends. 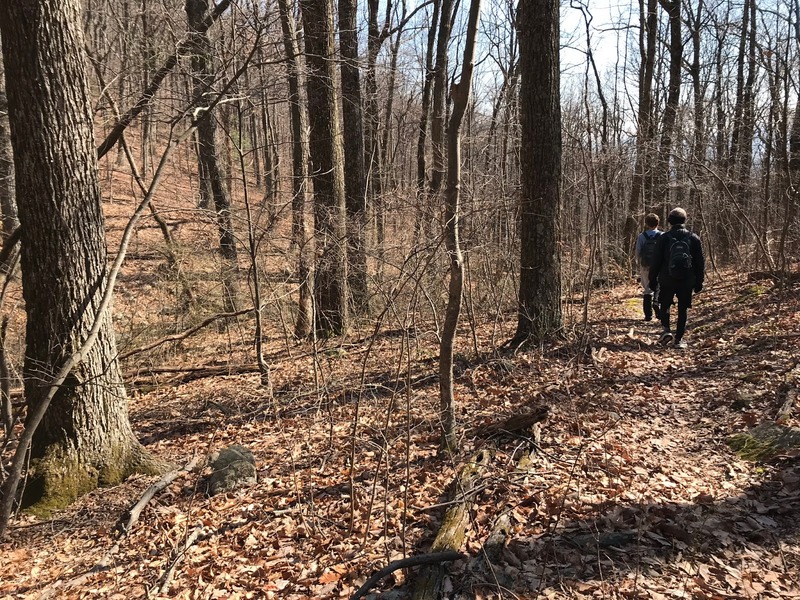 There is also a small campsite here, and I had visited this same spot four days earlier when leading a PATC-Charlottesville Chapter hike up the Sulphur Springs Trail from the west. I thought this could be an old AT alignment, as it connects 5 Points to the old Marble Spring Shelter site that is on the current AT. 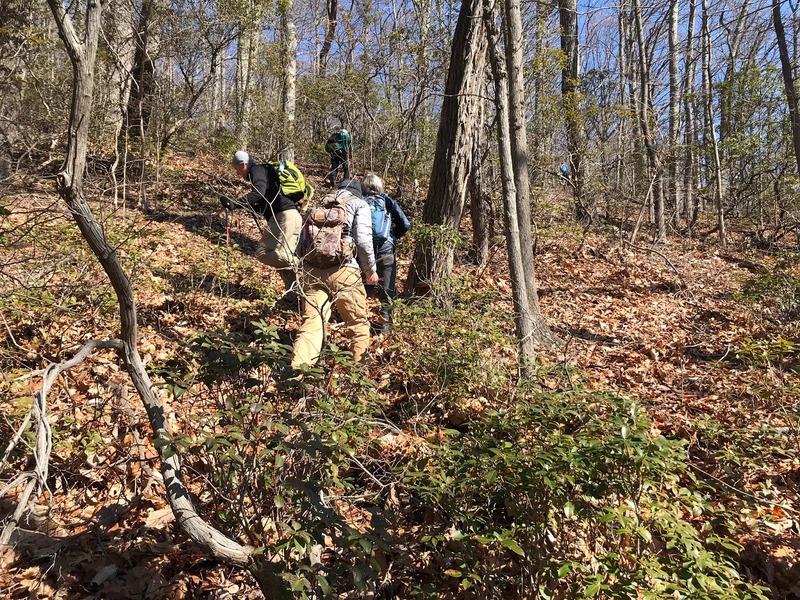 But none of the historic USGS maps show the AT using this route, dating back to 1935. 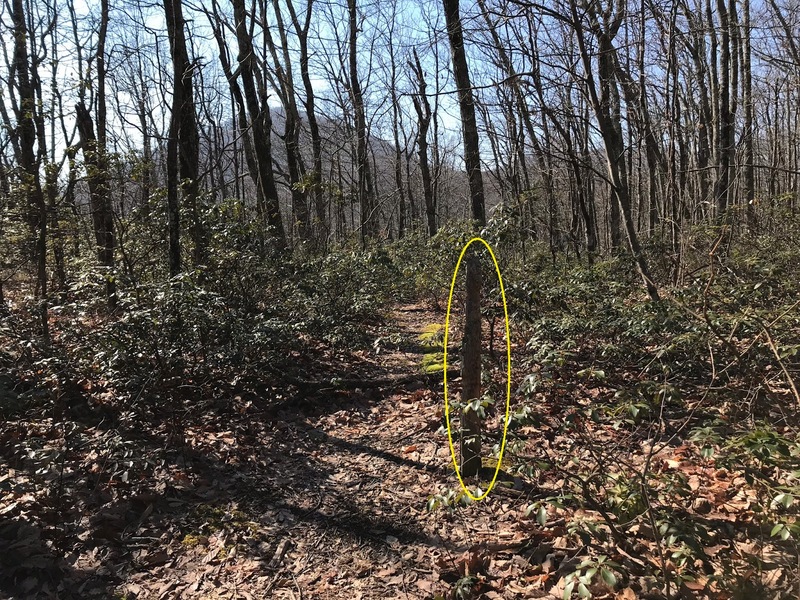 So I now believe that this was a side trail off of the AT and that the post was for a sign directing hikers to the Marble Springs shelter from this side trail. 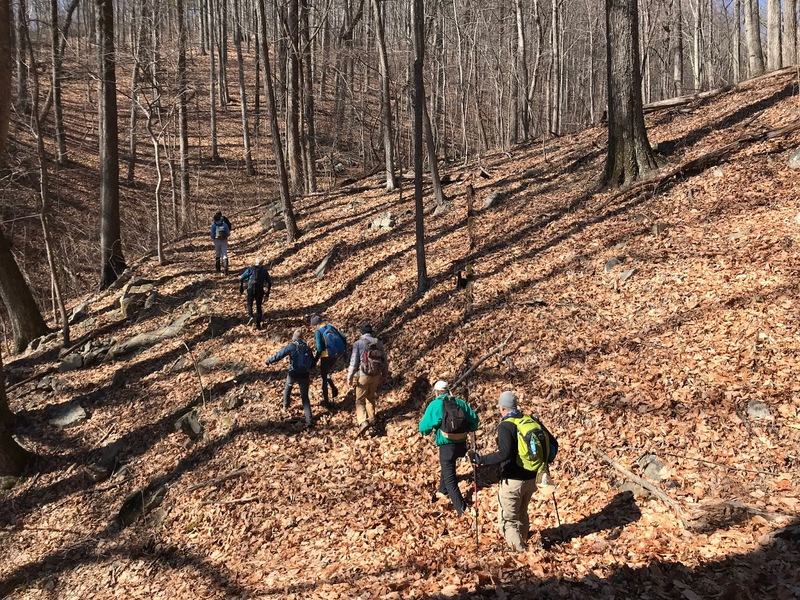 The trail is not described in any of the old guidebooks I have accessed, dating back to 1950. This old trail continues behind the signpost above, and then comes out at a campsite on the A.T. near where the Marble Spring Shelter used to stand. Our group stopped to look at a hollow tree and ponder the actual location of the shelter, but didn't stay long because the wind was whipping through this area. For some reason, the Marble Spring site is consistently colder than the 5 Points campsite a half mile away. 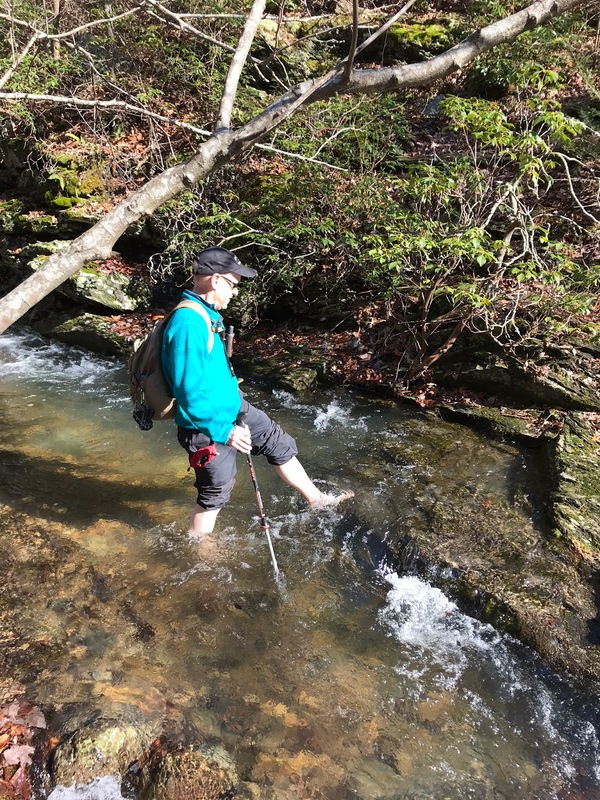 We headed south on the AT intent on climbing Highcock Knob, but found the trail too icy to continue. We turned around and returned to the shelter site. Back at the shelter site, we then took another former trail off of the A.T. 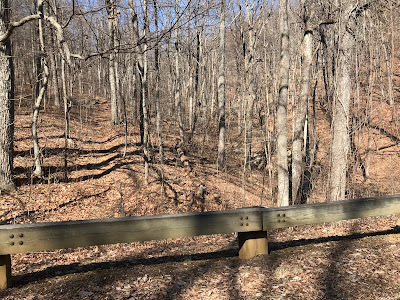 I had seen this trail a couple of years before when passing through here as leader of a group hike, and always wanted to check it out. 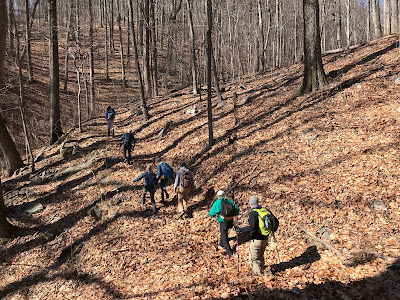 It was described in the 1974 edition of the "Guide to The Appalachian Trail in Central and Southwestern Virginia" as follows: About 30 ft. to the right of the lean-to [east], an unblazed trail to the Blue Ridge Parkway starts in a southeasterly direction, skirting down the right hand slope of the ravine. 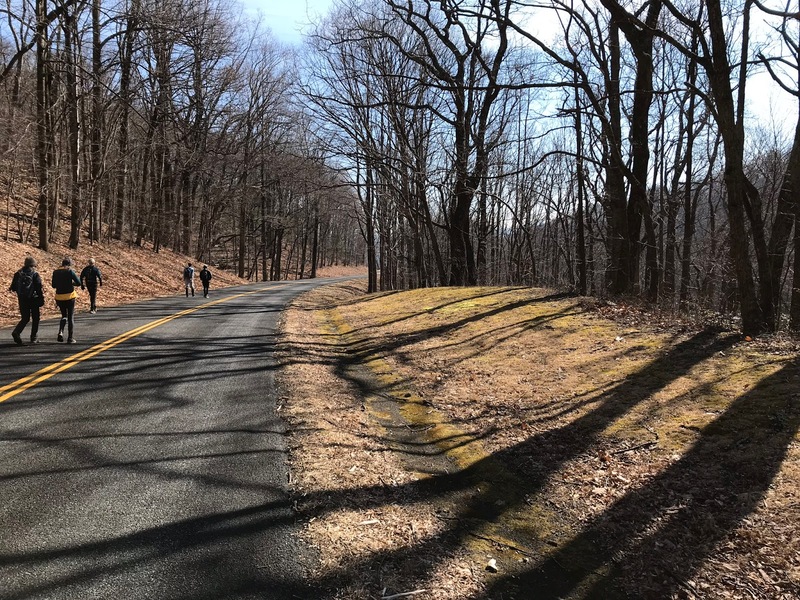 With one left and one right switchback, this trail leads 0.8 m. to the Parkway between mile posts 68 and 69. My next edition of the guidebook is about 15 years later, and there is no mention of this trail. In addition, the trail is not found on the most current USGS map, though it can be seen on older editions. 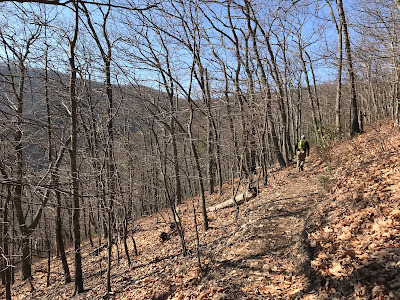 Unblazed trail connecting Marble Springs site to BRP. 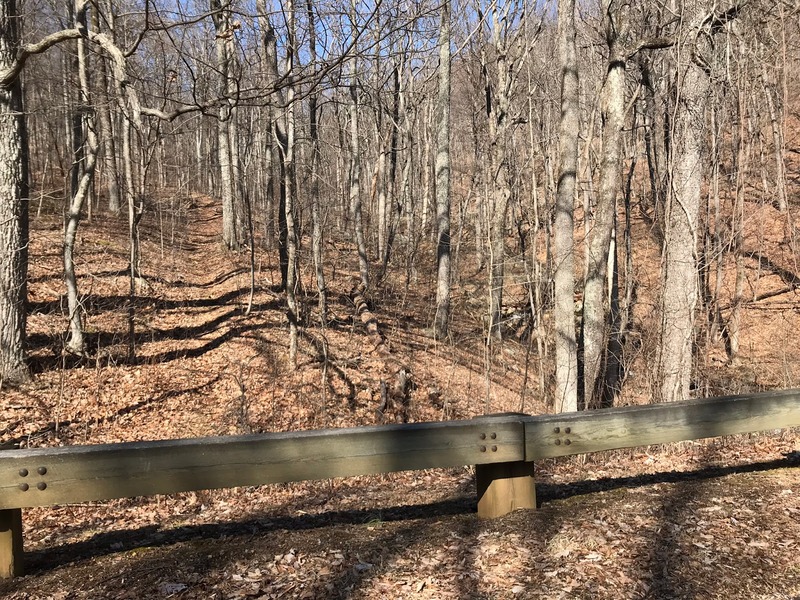 Amazingly, this trail was in fantastic shape, and I would highly recommend it! I hadn't expect much even though I'd been part way down it two years ago. 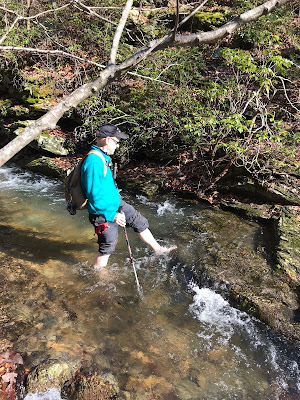 I had driven the BRP several times since learning about the trail and saw nothing from the road, so I figured it had gotten washed away at some point. But I was looking in the wrong spot. 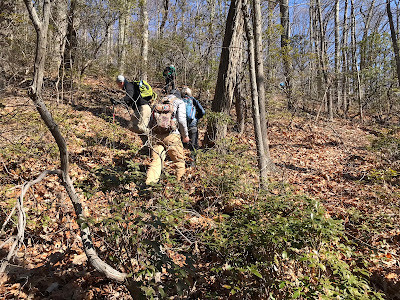 The trail doesn't come down as close to the rocky streambed as I had thought, and can be seen intersecting with the BRP in the photo below - on the left side of the photo. 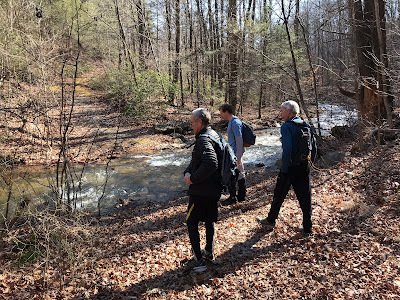 The trail took us down along the stream and out of the JRF wilderness boundary, onto the National Park lands of the BRP. We walked northbound on the BRP, passing the grassy area on the right where cars could park to explore this trail. But I wouldn't leave a car here overnight without contacting the BRP rangers first. 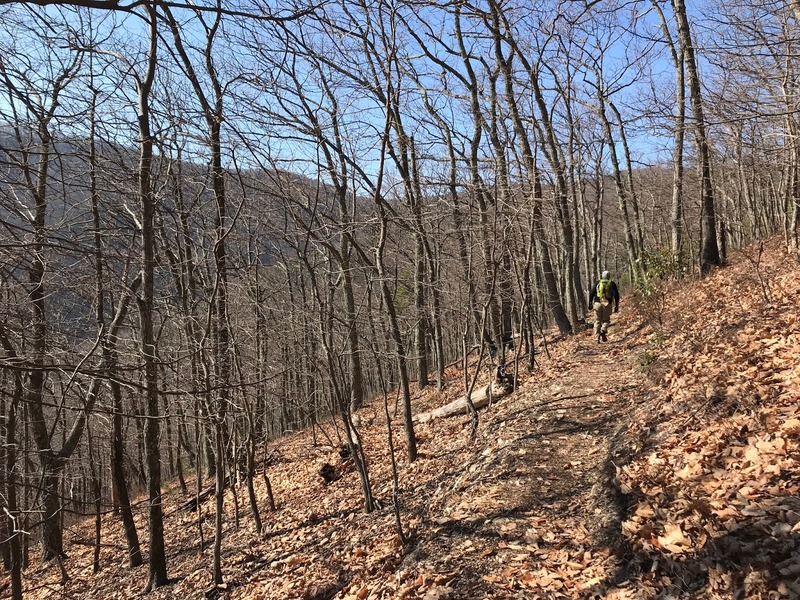 We crossed another streambed on the BRP, and then went off the road on what looked like an old roadbed. 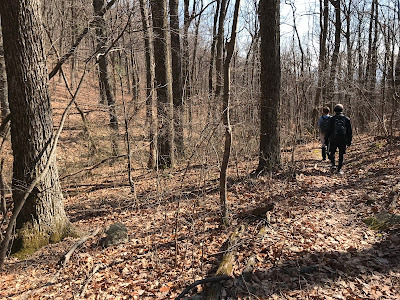 Unfortunately, it disappeared almost immediately, and we resorted to bushwhacking up the hillside, looking for an old woods road that our hike leader believed was somewhere upslope. It was a tough climb, but we found the road back within the wilderness and used it to head back in the general direction of our cars. We stayed within the wilderness boundary for about 1.3 miles on this old roadbed, which is not found on any USGS topo that I could access. 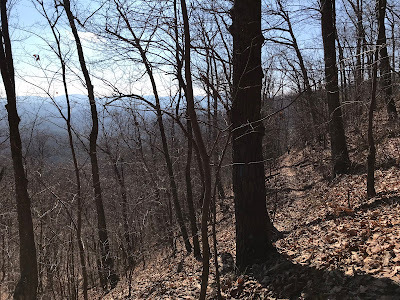 Bushwhacking towards an old woods road. Using the old roadbed wasn't always easy, because there was a lot of growth on the road. But there was a kind of trail that weaved through the growth, making me think that others (probably hunters) have used it. Pines growing in the old roadbed. There were times when the roadbed provided fantastic views to the east. You can see the Blue Ridge Parkway in this photo. Heading in the direction we did, the direction to take was always obvious when other old roads forked off. Heading in the other direction, one would need to head upslope every time. 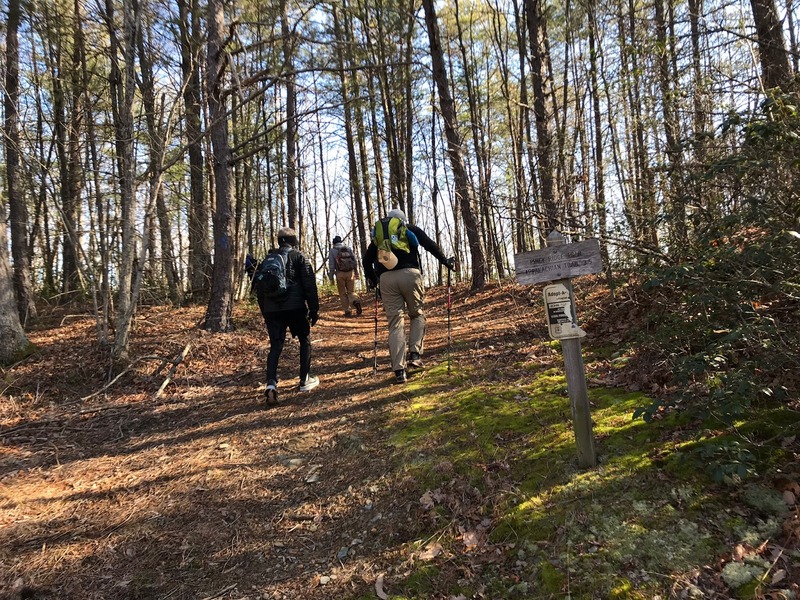 The last 2.9 miles were outside of the wilderness, but apparently still in the Jefferson National Forest. We were almost back to our cars when we had the biggest hurdle of the day - crossing a very healthy Peters Creek. Because we were so close to our cars, some folks just waded through the creek. I joined those who took shoes and socks off to cross. Either way, the crossing was really cold! Map of our route: Map.